See the location of bird and human cases of the H5N1 virus - and watch the spread of the disease over time. Birds can suffer from flu, just like humans, and there are 15 types of bird - or avian - flu. Migratory wildfowl, especially ducks, are natural carriers of the viruses. Most types of bird flu do not, but H5N1 - the strain found in Turkey - can be deadly to humans. There have been 117 confirmed cases of bird flu in south-east Asia, leading to 60 deaths. How do humans catch it? The virus is passed from infected birds through their saliva and faeces. Humans are likely to contract the disease after close contact with infected birds, most likely poultry. Since it not a food-borne virus, it cannot be caught through eating chicken. They are similar to other types of flu - fever, sore throat, coughs and muscle ache - as well as more serious conditions of eye infections, pneumonia and severe respiratory diseases. In the UK, every Gpin the country has been issued with guidance on how to deal with a possible outbreak. Can bird flu be passed from human to human? There is anecdotal evidence from the Far East that it can. But the real fear is that the bird flu could mutate with the human form of flu. This "nightmare scenario" , according to experts, could occur if the virus exchanged genes with a human flu virus if s person was infected with both at the same time. This development could cause a devastating pandemic and it is feared up to 50 million people worldwide could die, including more than 50,000 in the UK. The 1918 flu pandemic could have been caused by a bird flu virus. Vaccines to prevent the virus spreading to humans are currently under development. The are anti-viral drugs which might limit symptoms and reduce the spread of the disease. Where did the current scare originate? It is thought to have started in China and spread through Asia. Will it reach the UK? The fact that the virus is carried by birds makes it difficult to prevent its spread. But because the source of the current outbreak is known, the migratory patterns of wild birds should provide early alerts of the arrival of infected flocks so they can be killed on arrival. And in the UK there are already measures preventing wild birds getting into poultry houses. A fatal strain of bird flu has recently infiltrated human populations in Vietnam and Thailand. The result of this merging might result in a new, highly infectious, rapidly fatal flu virus. Such a new virus would be transmitted rapidly from person to person with potentially devastating results. Common flu - kills up to 2 percent of people it infects, with elderly, young children and people in developing countries more at risk.This means that sensitive people who need the medicine to overcome ordinary flu, primarily the elderly, will need medication to help avoid and fight the bird flu virus. An initial government solution being introduced is to only stockpile quantities of medication that are sufficient for key personnel who are essential to the continued functioning of society, such as medical personnel, rubbish collectors and government officials. Burning questions arise. Is such selection ethical? Who is essential? The following top latest information & resources will help you find out the facts, including how it is transmitted , containment, symptoms, treatments & danger. There were three major flu pandemics in the 20th Century. In a mere 18 months between 1918-19, "Spanish" flu is believed to have killed up to 40 million people world wide - some estimates put the death toll even higher. In 1957 "Asian" flu killed around a million people, although it was thought to have infected more than 10% of the world population. The latest outbreak was in 1968 when "Hong Kong" flu also killed about a million people. Health experts expect a pandemic to emerge from south-east Asia, but the Foreign Office is not advising people to stay away from the area. However, almost 150,000 anti-flu jabs will be ordered for our communities as fears rise that the world is facing a threat from deadly strains of the virus. Over the next two years the government will spend £200m buying 14.6m doses of Tamiflu, an anti-viral drug which eases flu symptoms. Local health protection bosses are now preparing to meet NHS chiefs, GP's, emergency services, voluntary groups and councils to make sure that areas of the country do not grind to a halt if there is a massive outbreak. Since January last year here have been 42 human deaths from "bird" flu in Thailand, Cambodia and Vietnam. The World Health Organisation (WHO) believes that such viruses could become more infectious, and in the age of mass air travel, could spread quickly across the globe. Consultants in communicable disease control believe that it is a question of when - not if - a flu crisis will strike. The big fear is that a new strain of flu, possibly starting among animals, will turn into a human pandemic - when a new strain emerges which people have no immunity against. We are long overdue for another pandemic and have to consider how we keep society working. Without medical precautions, experts believe that 50,000 people in the UK could die from a new lethal virus - more than four times the normal annual death toll. At the moment an effective vaccine is impossible to develop because nobody knows which strain will emerge. After announcing the 14.6 million doses of Tamiflu, health secretary John Reid said: "It makes sense to ensure we in the UK are as prepared as we can be and have drugs for use against an influenza pandemic here. This will enable us to treat one in four of the population which WHO recommends we plan for." The government's chief medical officer Sir Liam Donaldson added: "Wherever in the world a flu pandemic starts, we must assume we will be unable to prevent it reaching the UK. When it does, its impact will be severe in the number of illnesses and disruption to everyday life." Q. Why should humans worry about bird flu? A. Avian, or bird flu, can be spread to humans, probably through the breathing in of dried bird droppings which can carry the virus. Q. Is it more dangerous than normal flu? A. There are 15 strains identified so far - including the H5N1 version of the virus which is proving deadly. Humans have not been able to build up immunity to these strains and so have little defence. Q. Is it always deadly? A. No, although the current death rate is high. 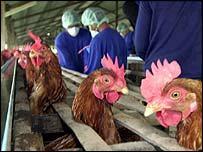 Since January 2004 there have been 55 confirmed cases of bird flu, with 42 deaths. Experts believe that a more easily-passed strain may have a lower death rate. Q. Can I still eat chicken? A. Experts think eating chicken is still safe, although the Foreign Office advises people in south-east Asia to be careful about making sure the meat is cooked. Q. Can bird flu pass from person to person? A. Probably, although so far not easily. The strains so far are thought to have been passed between relatives, but only in small clusters rather than on a massive scale. Q. What are the chances of it reaching Britain? A. Very low at present, but if a new strain of bird flu develops, or it combines with human flu, the virus could spread rapidly across the whole globe. More information about bird flu and the risks can be found at www.dh.gov.uk written by the Chief Medical Officer in the "Heads of Profession" section. The growing number of cases of avian influenza, or bird flu, in Asian countries is causing increasing concern. You can click here or on the link above to browse further for latest news updates & resources for the elderly. Don't lose out, watch this space for regular asian bird flu virus updates! All content © 2003/2004 Mabels.Bird flu virus. All rights reserved.